Cradock – Cape canoeing star Michéle Eray has her sights firmly set on the Hansa Powerade Fish river canoe marathon next weekend for three reasons. She has never won the race, she regards it as the years paddling highlight, and the 82km marathon will mark the end of a long year and the start of a well earned rest. 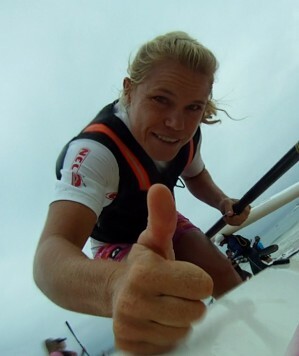 The cheerful 30 year old former Plettenberg Bay resident now living in Cape Town has three second places and a third place in this key race to her credit, and wants to add the K1 title to the long list of victories that she has notched up in the past twelve months. She has been unbeaten in surf ski races since snatching international titles in Hong Kong and the lucrative Dubai Shamaal last year, and went on to win the prestigious Drakensberg Challenge on the technically demanding Umzimkulu river in February. Apart from the attraction of the SA championship medals, Eray has a deep seated desire to win the Hansa Powerade Fish title, particularly as she has spent much of her competitive life in the Eastern Cape. “It’s easily the best race of the year, and you can see that in the size of the entry again. But I have come second and third too often and I am a little sick of that,” she said impishly. She will be focusing her training on river skills in the build-up to the Fish, and after a weekend training on the Bontebok, she will spend several days in Cradock preparing on the race course. “I actually haven’t been on moving water since the Drak Challenge, so that is my priority now,” said Eray. However this echoes her sentiments before the Drak this year, where her cool head and technical river skills saw her win that race on debut while all her challengers succumbed to the challenges of the mountain river. “A good result in this year’s Fish would be the perfect end to a long, long year, before I have to get to form again for the defence of my Dubai Shamaal title” said Eray. The Hansa Powerade Fish starts at Grassridge dam on Friday 2 October and ends in Cradock on Saturday 3 October.